Gold coins have been historically popular amongst investors and collectors, especially due to the high value of the gold’s price and its strong correlation with the price of crude oil. However, its rarity and inherent value places gold bullion in greater demand than silver bullion because gold has stood the test of time as a form of currency and as a hedge against devaluation or inflation. Without any doubt, the most popular gold coins in the world are U.S. Gold Coins manufactured by the United States Mint. These coins are particularly preferred by savvy investors due to their remarkably beautiful design and high gold purity. 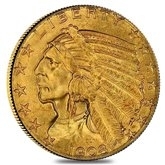 The U.S. gold coins presently available on the market range from Pre-1933 U.S. minted coins to the U.S. Gold Bullion coins like the U.S. Commemorative Gold Coins, Gold American Eagles, and the Gold American Buffalos. Their sizes vary between 1/10 oz., ¼ oz., ½ oz. and 1 oz. for the new American Gold Coin designs to the Pre-1933 Quarter Eagles ($2.5), Half Eagles ($5), Eagles ($10), and Double Eagles ($20) with weights from .1209 to .9675 oz. 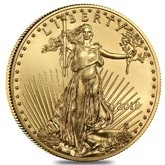 The most treasured U.S. Gold Coin design is considered to be the 1 oz. Gold American Eagle. This gold coin design is highly appreciated by investors and collectors all over the world due to its easily identifiable appearance. The obverse side of the coin carries the striking design of Augustus Saint-Gaudens: a depiction of the Lady Liberty carrying an olive branch in one hand and a torch in the other, with her hair flowing and the U.S. Capitol building engraved in the left background. On the reverse side of the coin, an American Bald Eagle is depicted flying over to his family while holding an olive branch in his talons. The Gold American Eagle made its debut in 1986 and continued to be manufactured with denominations of $50, $25, $10 and $5, according to their sizes. The coins are available in three editions: Brilliant Uncirculated, Proof, and Certified. Another impressive American gold coin design is the American Gold Buffalo. This unique gold coin produced by the U.S. Mint is the first of its kind composed of .9999 pure gold. These coins were released to serve as competitors for other high-quality foreign gold coins like the Canadian Gold Maple Leaf. The design of this coin was inspired by the Buffalo Nickel, first released in 1913. The masterful depiction featured on the coin is the work of the famous American sculptor James Earl Fraser. The obverse of the coin features the profile portrait of a Native American, depicted as a mix of the incredibly detailed facial features and hair braid elements of three different tribe chiefs: Big Tree (Seneca), Iron Tail (Lakota), and Two Moons (Cheyenne). On the reverse side of the coin, the famous American symbol, the buffalo is depicted and inspired by a real bison that lived in New York City’s Central Park Zoo. The Gold American Buffalos were first introduced in 2006. The U.S. Mint produces a large variety of designs for commemorative coins. These coins always carry images of important and iconic figures, places or events in American History. These coins are highly appreciated by passionate numismatists. The most popular U.S. Gold Commemorative coin designs are the $5 Commemorative Gold coins, the $10 First Spouse Gold series and the Centennial Gold Coins. The $5 Commemorative Gold Coins were released in 1986 and feature the Olympic Games, The Statue of Liberty, the American Bald Eagle, Mount Rushmore, the 50th Anniversary of the United States’ victory in WWII, Mark Twain, and many other honorable figures. The $10 First Spouse Commemorative Gold Coin was introduced in 2007 and each year carries the depiction of the First Lady corresponding to the president depicted on the Presidential Gold Coin issued in the same year. The Centennial Commemorative Gold Coins minted in 2016 celebrate the 100-year anniversary of the three most important historical gold coin designs minted: the Walking Liberty, the Standing Liberty and the Mercury (Winged Liberty) first produced in 1916. Pre-1933 U.S. Gold Coins are exclusively rare pieces of American Gold coinage. These coins have been produced between 1794 through 1933 when President Franklin D. Roosevelt signed an executive order making it illegal for U.S. citizens to own gold coins in order to prevent hoarding and help jumpstart the depressed economy. Those in possession of gold coins were obliged to return them to the U.S. Treasury for the purpose of melting them down and transform them into gold bars. However, despite most of these coins having been removed from circulation, some of these exceptional gold coins survived and are still available on the market. Pre-1933 coins carry various designs and sizes, mainly ranging from .1209 to .9675 oz. The most popular designs are the Indian Head, the Saint Gaudens, and the Liberty Head. 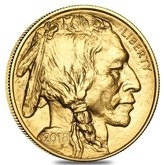 The Indian Head Gold Coins depict the profile picture of a Native American Chief. The Saint Gaudens Gold Coins carry the grand design of Augustus Saint-Gaudens’ image of the walking Lady Liberty that carries an olive branch and a torch in her hands, with the Capitol Building engraved on the left background. 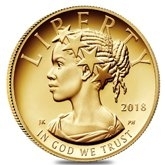 The Liberty Head Gold Coin is depicted in profile picture with a coronet atop her head. Bullion Exchanges is proud to offer all of these new and rare American Gold coins at some of the most competitive prices on the bullion market. We provide an easy buying experience for you and understand that your satisfaction is our main priority. If you have questions about the beloved American Eagle Gold Coin, please feel free to contact us at 800.852.6884. You can also reach our friendly and helpful Bullion Exchanges customer service associates online through the use of our live chat feature, or by email at info@bullionexchanges.com.